RPF SI Recruitment 2018: Railway Protection Force (RPF) has released RPF SI notification for 1120 Vacancies of Sub-Inspector (SI) Post. RPF SI Online Application Form starts from 1 June 2018 and the last date to fill online form is 30th June 2018. The Last Date for Online Form Submission is extended to 10th July 2018. The Male and Female both aspirants can apply for RPF SI (sub-inspector) Jobs. However, RPF SI Recruitment is under processing and it is expected that the detailed notification of RPF SI Recruitment 2018 notification is available on Employment Newspaper dated from 19th May 2018 to 25th May 2018. Here, We are providing you complete details about Railway Police SI Recruitment 2018 (RPF). 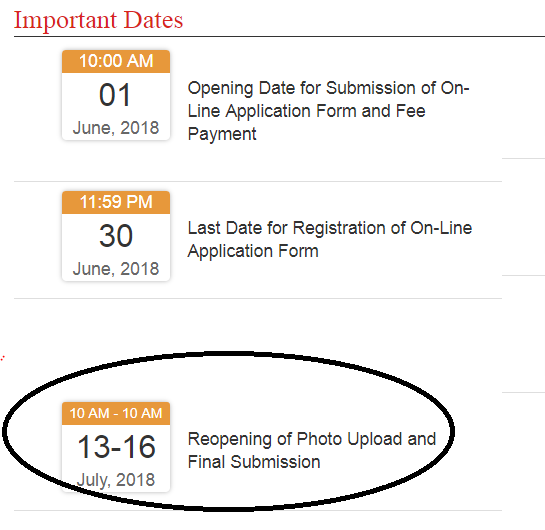 Latest Update :RPF has Re-Opened the Link for Submit Application and Upload Photos from 13th July to 16th July 2018. The candidates can now upload photo and submit their Application form until 16th July 2018. RPF has found error in photos of many candidate’s Application that’s why RPF has reopened the link for change/upload photo & Submit Application. The link to Apply online for RPF SI Application Form is available below. You can click on that link (mention below) and Apply directly. Railway Minister has announced total 9500 vacancies for the Male and Female Sub-Inspector and Constable posts. RPF SI Vacancy is not mentioned clearly by Railway Minister. It is expected that RPF will release 1120 vacancies for RPF SI Posts. Candidates those who are interested can go through this article to get the necessary details. The Application Forms will be soon available on the website -rpfonlinereg.co.in. Candidates can visit this page to get the details about the recruitment. The Age-Relaxation for the Reserved Category candidates will be applicable as per the Government Norms. The Age-Relaxations for the Reserved Category candidates will be applicable as per the Government Norms. The Candidate must have completed Potential Band Masters Course or Equivalent. The Application Fees for General (UR) Category is Rs 500/- out of which Rs 400/- will be refunded if he/she appears the CBT. The Application Fees for Reserved Category is Rs 250/- out which Rs 250/- will be refunded back if he/she appears the CBT. Click on the Modify Application Link below. Candidates, if you have applied for Railway Protection Force Sub Inspector Posts, then you can now print your application form in seconds. The RPF provides candidates a secure facility to print their application form in few seconds. Keeping a print of the application form is very much required if you are applying for a certain Exam/ Job Recruitment. This can be useful in future reference. This year, the Railway Protection Force has invited over 1120 vacancies for aspiring candidates. Thus, candidates can now print in their RPF SI Application Form. In this article, we will provide you complete details about RPF SI Recruitment 2018 Print Application Procedure. The Exam Pattern is a very important element in the recruitment or selection process. This can be very useful for the candidates who will be appearing the Written Examination. The Exam Pattern comprises of the Question pattern, syllabus. Marking scheme of the Examination. Thus, the candidates are advised to check for the Exam Pattern before starting their preparation. The Exam will be a Computer Based Test, that means the Exam will be conducted online. Candidates can choose language options for the Computer Based Test. Languages available are: Hindi, English, Urdu, Tamil, Telugu, Konkani, Malayalam, Kannada, Marathi, Gujarati, Bengali, Odia, Assamese, Manipuri, and Punjabi. The Standard of the Examination is Graduation Level. There will be four sections- General Intelligence and Reasoning, General Knowledge, and Numerical Aptitude. The General Awareness section carries 50 marks and the Arithmetic and General Intelligence and Reasoning carries 35 marks. Total marks of the Examination is 120 marks with a total time duration of 90 minutes. For each correct answer candidate will be rewarded with one mark and for every wrong answer 1/3 rd marks will be deducted. Qualifying marks for the General Candidates is 35% and the qualifying marks for Reserved candidate is 30%. Coding and Decoding, Number Series, Embedded Figures, Analogy, Alphabet Series, Directions, Non-Verbal Series, Number Ranking, Blood Relations, Decision making, cubes and dice, Arithmetical Reasoning, Mirror Images, Clocks and Calenders. Computation of Whole Numbers, Discount, Operations Research and Linear Programming, Differential Geometry, Computation of Whole Numbers, Statistics, Algebra, Statics, Fractions, Time and Distance, Number Systems, Fundamental Arithmetical Operations, Essential Mathematics, Differential Equations, Ratio and Proportions, Profit and Loss, Time and Work, Percentages, The relationship between numbers, real analysis, interest, analytical geometry, dynamics, mensuration, averages, decimals, calculus and use of tables and graphs. Question 1: How do I know that my application is registered? Answer: There are five stages in registration. Your RPF SI registration is successful only on completion of all the stages including the fee payment and photo upload. You will receive an email and SMS alert on the completion of successful registration. After the preliminary registration, you will receive the Registration ID. Please preserve it for future use as all subsequent logins are only based on the Registration ID and your Date of Birth.Kindly note that successful registration does not imply that application has been accepted. Eligible/Rejection status will be put up after scrutiny. Question 2: I did not receive the email intimation for registration of my application? Answer: The Registration ID is sent by auto-response confirmation emails. Delivery of these emails purely depends upon the correctness of E-Mail ID provided, policy of your E-Mail Service provider to accept and divert such emails under Bulk or Spam Mails or bounce back such mails without accepting it due to heavy number of emails generated by our Applications. In case of Govt./official /company Email Ids, delivery is controlled by your company policies. Please check your Bulk or Spam folder before you contact Helpdesk if you are unable to proceed with your registration. Question 3: How do I re-confirm that my application is saved? Answer: In case of doubt about the successful completion of application, candidates are advised to visit the page for Print Application, generate the Printout and preserve the hard copy (printout) of the Application. closed/ hanged / shutdown. Is my application saved / registered? Answer: Please refer to Point No.6. If you do not get the application printout through Print Application option, your application is not saved. Please re-apply. Question 5: What details should I retain while replying to auto-response emails? Answer: You need not respond to auto-response emails. But please preserve the Registration ID, which is the main basis for your future logins to reprint application, download Admit Card etc. Question 6: What details should I provide while writing for the problem? Internet Browser & version (like Internet Explorer 6.0, Mozilla 3.0, Firefox 3.5 etc.) used. Question 7: I am a fee exempted candidate, should I also make fee payment? registration process, which will be refunded if the candidate appears for the CBT. Question 8: Is the Examination Fee refundable? Question 9: I want to change / correct the details I entered in the Application? Answer: You have to be very careful when you fill in your registration. If you want to change any details in your application after the completion of your registration process, you have to choose ‘Modify Application’ from the Home Page of the registration portal. You have to pay a non-refundable fee of Rs.250/- for modifying your application. After successful payment of the fee, you can edit your application and make any changes required. However you will not be able to edit your RPF zonal group, Registration number, email ID and mobile number with which you have registered. Question 10: Whether I need to pay the Exam fee again if I modify my application? Answer: A non-refundable fee of Rs.250/- for modification is applicable for the all the candidates including the fee exempted candidates. already paid by you earlier will not be refunded. Question 11: Is it mandatory to fill the Bank account details? refund will be done only on appearing in the CBT. Question 12: Can I change my RPF zonal group using Modify Application option? selection of RPF group once exercised shall be final. Question 14: I have paid the fee through Postal Challan. Now is there any further process i.e. entering the receipt/ journal number online? Answer: No. Once you have made a successful payment, kindly wait for two working days for your payment to get verified. Once your payment gets verified, you can login throughthe ‘Candidate Login’ link from the Home page of the Registration Portal and proceed with the further stages of registration. Question 15: While making online payment, I could not pay it due to some computer problem. I would like to pay exam fees by offline mode through post office or SBI Bank. For that what should I do? Please help me. Answer: You can modify the payment mode and make the payments accordingly. Question 16: I have not printed my application? Where can I get it? from the Home Page of the Registration Portal, provided you must have completed your application. Question 17: What does the “Date to be printed below the name on the Photograph” mean? Answer: The date to print in the photograph denotes the date of taking the photograph and it should be on or after 01-12-2017. Refer CEN for detailed specifications about the photograph. Sir I had applied for RPF SI 2018 but my application as been rejected because of unacceptable photograph. Is there a chance for modification? When is the exam going to be conducted? How many aspirants applied for SI post in Group A? Also there is no details for such applications…. At least provide the contact details of authorities to whom we should contact in such conditions…. Can anybody from audience can suggest me the solution ? date of birth got wrong in the application and i try to modify and a i done with payment too, but still cant be modified. why? Sir, my graduation result out in july,2018 , can i apply for the RPF SI???? Please contact with helpline number on official site. Sir i have done my graduation final exam in this month…so can i apply this rpf si post???? Where is the education criteria?